Nestled in a simple cube of a room, Coenesthesia takes the interactive component of a VR experience a step further. I was greeted by an attendant who instructed me to stick on electrodes onto my body (like an EKG test). Once I connected to the electrodes and the headset, I was instructed to face the fuzzy ball on the floor (another piece called Frisson Portal which visitors are encouraged to hug! ), after which I was promptly plunged into Coenesthesia’s universe. It’s quite hard to describe everything in this universe. Massive planet-like objects float in outer space, surrounded by an even more massive ring made up of waves. I put my arms out and twist it in order to fly forward, and the first stop I make is to the red heart that is beating to the beat of my own heart, due to the electrodes. I fly into the heart, which is so giant it envelops me whole, and watch and hear my own heart beat – in my own heart. It’s an indescribably surreal sensation – to be outside and inside my heart at the same time. Embodied by my own heart, the extension of my body becomes hazy. I fly through the other objects. Some are vague spheres of moving water, some are abstract shapes. There’s even a brain I can fly through. If not for the motion sickness and tired arms, I would have explored this universe for hours. In this universe, I am simultaneously my original physical body, a fellow planet, and a soaring star. Fragmentation in the most intriguing sense. Thanks to everyone who made it out to see my biometric VR experience at Gamma Space! Extra thanks to the Ontario Arts Council, DamesMakingGames, Workman Arts and Trinity Square Video for their support in making this happen! Claudette Abrams did an amazing job currating the show which also showed amazing work from Laura Kikauka, Kat Singer, Stephanie Avery, Janieta Eyre, Hanan Hazine, and Wendy Lu. 3.2 Creating a Sense of Body Ownership Over Virtual Body Parts. First I want to clarify the use of ownership. Here I do not write in socio-economic terms of ownership. Ownership in this context comes from the language used in neuro-prosthetics research, to establish things that are included as being part of the makeup of one’s physical body. Whereas amenable objects are the realm of ‘me and not me extension’ somewhere between subjective and objective, so too are prosthetic limbs. I look to the field of cognitive neuro- prosthetics to establish techniques for creating a sense of body ownership over virtual representations of body parts. This field builds, “models of self-consciousness in order to project them onto artificial limbs, avatars and robots.” (Blanke, 2012) I look at a few contributions to this field that seem relevant to my mission. In 1998 Botvinick and Cohen established the ‘the rubber arm illusion’. This is an experiment where one arm of the participant is hidden from view and a rubber arm is positioned where the participant’s real arm would typically be. The experimenter then simultaneously brushes both the real arm of the participant and the rubber arm for length of time. This synchronization creates a sense of body ownership in the participant for the rubber arm and when it is threatened with pain, they jump to protect it. This experiment shows how sight, touch and proprioception combine to create a convincing feeling of body ownership, one of the foundations of self-consciousness (Nature, vol 391, p 756). In 2007, Frank H Durgin et al, expanded on the rubber arm experiment. They replaced the brush with a laser and discuss the results in terms of multisensory integration. Vision, Touch and Synchronisation are all key elements. Experiments along similar lines, established the mirror therapy method (Ramachandran, 1994), to relieve pain in phantom limbs. Using a mirror to recreate a mental image of the missing limb was found to alleviate pain in the phantom limb and over time to remap the mental image of that limb in the brain of the amputee having a lasting effect on the pain relief. With the limb missing, confusion develops in the signals sent between the limb and the brain, forming in some patients a mental image of a cramped up, clenched hand. When a mirror is used to substitute an image of the opposite arm there is instant pain relief when they see the hand stretched and relaxed. The mental image of the limb is key to the experience of it. Heautoscopy is a phenomenon where patients have a sensation of being reduplicated and to exist at two or even more locations. It has been found that self-identification with two virtual bodies was stronger during synchronous stroking (Heydrich, 2013). This proposes that having more than one version of organs in the virtual space I am creating will allow the user to identify with more variations of organ representation. To make effective use of the sound component in the research creation VR project, the sound component incorporation is influenced by the findings of Noel et al, in which they consider acoustic stimuli, in the mix of synchronous stroking during the rubber arm illusion, “the distance at which acoustic stimuli are presented may alter the balance between self- and non-self, biases.” (Noel et al, 2017). Insights gained from this research include the fact that light when employed through synchrony with a physical sensation can contribute to a sense of body ownership and of heautoscopy, actively engaging motor neurons and the position of acoustic stimuli are also of key importance to the mix. In Coenesthesia I create a synchronous link between the immersant’s real organs and the virtual representations of the body organs and virtual objects through synchronous biometric data. into the body schema or body image (Head et al., 1920;Schilder, 1938). 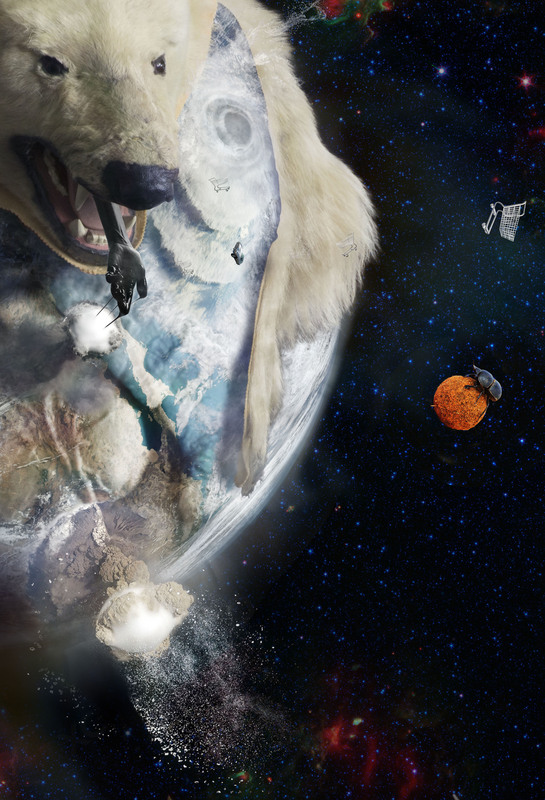 I am constantly trying to heal people and systems that are sick or broken and this call for pieces on Climate Change seemed the perfect opportunity to connect with the spirit of the bear I had been harboring for ten years. The world is a living breathing organism and some climate change is natural. What we continue to do to this planet it to make it sick. This piece is meant to help us visualize our global impact, to inspire us to stop being a plague on the earth and live symbiotically with nature, to not buy in to the consumer culture that has flourished on this plant with the ego maniacal behavior of most humans.